MBM's Triumph Kutrimmer 1038 Paper Cutter is a heavy duty table top paper trimmer that has a 50 sheet capacity and a 14 3/4" cutting length. The overall table size for the 1038 is 16" x 14 1/4". The Triumph Kutrimmer 1038 has an independent manual clamp, lockable back gauge, precision side guides, all metal construction and a clear safety guard to protect the operator by covering the blade in any position. The Kutrimmer 1038 also features a fold away paper support for trimming oversized documents. Manufactured in Germany by MBM's parent company, IDEAL, Triumph Kutrimmer paper trimmers are built to the same exacting tolerances as Triumph cutters. All Triumph Kutrimmers utilize solid, all-metal construction and the highest-grade Solingen steel blades. Advanced features such as transparent Lexan blade guards and automatic blade covers ensure the safety of the operator. All MBM Triumph Kutrimmer cutters have Solingen steel blades that may be removed and resharpened. This cutter is awesome! Great precision. Easy to use. The parts are solid, efficient, and well made. Well worth the money. I purchased this after trying several standard off-the-shelf cutters - none of which had the square precision that this one has. Love the clamp to keep paper from moving. Bought this cutter for our workroom. It cuts accurately every time and the clamp holds items during cutting to prevent them from shifting. Welcome to MyBinding video. This is a look at the Kutrimmer 1038 Paper Cutter. It's a tabletop paper cutter that can also be used on a stand made by MBM. This guillotine-style paper trimmer is heavy duty. Its all metal construction is built to last and the many options on it make for professional trimming a cinch. The retractable table is opened and closed by the large red dial on the front. This is especially useful for trimming large and oversized documents or when combined with the optional stand that you can purchase to hold this up as a solitary unit. An adjustable fence rides along a ruler to track, designed to make consistent cuts throughout an entire project. It clamps down and holds its position well. An independent manual clamp pulls papers in place without any slipping while cutting. The flexibility of using the clamp or not is nice because you don't necessarily want a paper clamp for all kinds of projects. The Soligen all-steel blade is fantastic and can actually trim through 50 sheets of 20-pound paper in a single trim. Here, we're doing 25 as a test, doubling that over to make a total of 50, and we trim right through it with minimal resistance. With plenty of strength, durability and ample measuring tools on the surface of this machine, this is a great buy if you have a lot of trimming to do. That is the Kutrimmer 1038 by MBM. For more demos, reviews and how-tos, check out mybinding.com. The 1038 has one of the best cutting capacities you could ever hope to find. It has the ability to slice through as many as 50 sheets of 20 lb. bond paper at a time. Because of this, you'll definitely be able to finish up your cutting job in no time. This trimmer can be used to cut paper that's just over 14 inches long. You'll be able to use it for smaller documents, as well as ones that are letter- and legal-sized. If you'd like to trim oversized paper, the 1038 comes with paper support that folds up when you're not using it. The 1038 is made from high-quality components including Lexan plastic for the blade guards and Solingen steel for the blade itself. (The other parts of the device are made from metal for durability.) Solingen steel of one of the best metals available and it really makes the blade both strong and sharp. The blade can be removed from the cutter and sharpened, so you'll be able to get years of use out of it. This cutter is safe to use, thanks to its Lexan blade guards. These guards help keep your hands away from the blade so you can have a safe cutting experience. Also, there are rubber feet on the bottom of the trimmer so it won't move around unexpectedly when you're using it. The1038 has cutting guides printed on the base that make it easy to measure your paper properly. These guides have both standard and metric measurements for your convenience. When you're ready to cut, you can make sure the sheets stay in place by using the attached paper clamp. If you're concerned about this trimmer take up too much room, you don't need to worry. It has dimensions of 23" (depth) x 15.5" (width) x 10" (height) so it should fit on your work rather easily. Also, it weighs just under 30 pounds, so it won't be difficult to move it around when the time comes. Finally, the 1038 is backed by a 1-year warranty. Unfortunately, the warranty doesn't extend to the blade. Recommendation: The MBM Kutrimmer 1038 is a great choice if you're on the lookout for a cutter that can process a lot of sheets at once. A 50-page cutting capacity is simply unbeatable, unless you're looking to get a stack cutter. (Stack cutters can cut hundreds of sheets at once.) You'll also find that this device offers some great safety features and that it's really easy to get the cut you need, even if you're working with oversized paper. So all together, the 1038 is worth your consideration. Take a look at it today. Cutting Length 15" 13 3/4" 13 3/4" 18" 22 1/2" 28 1/2"
Table Size (D x W) 23 3/4" x 14" 15 x 12" 15 x 12" 20" x 14" 23 3/4" x 14" 30" x 20"
Dimensions (D x W x H) 31" x 16" x 10" 22 1/4" x 13 1/4" x 12" 23" x 13 3/8" x 12 3/4" 27 1/2" x 15 1/4" x 15" 31" x 16" x 10" 38 1/2" x 22 1/4" x 20 1/2"
I need to cut through .125 binders board. Can this machine handle it? Thank you for your question. The MBM Triumph 1038 15" Tabletop Paper Cutter would be able to cut binder board one sheet at a time. My 1038 is cutting crooked by about an 1/8 of in inch. Is there a way to adjust the blade? Thank you. Thank you for your question. I am sorry to hear you are having issues with your Triumph 1038. To address technical issues the best first step is to contact the manufacturers technical support department. The manufacturer is MBM and their phone number is (800)387-2528. Thank you for your question. The demonstration in the video was cutting 50 sheets of 20# stock which is at the upper limit of the capacity of the trimmer. Being able to cut through smoothly in a single motion is the best way to ensure a clean cut. If you are needing a trimmer to cut in large capacities a stack cutter would be a better option. 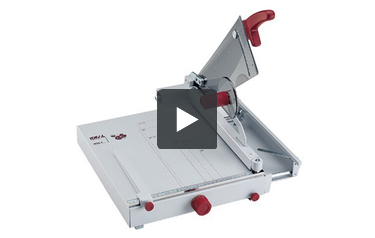 You can find our selection of manual stack cutters here . For cutting less than 50 sheets of 20# paper at a time the MBM Triumph 1038 Paper Cutter is a great option that has several features other cutters lack, such as the fold-away paper supports on front gauge which helps with getting a precise cut.